President Trump recently made good on one of his campaign promises to the wealthy interests that run the increasingly lucrative nursing home industry. He recently did away with a rule designed to protect the rights of some nursing home residents to bring lawsuits if they are abused, neglected, or otherwise mistreated. “It’s too late to help my mother,” Marzolla-Persi said, but she’s hopeful it will protect other elderly patients and prevent others families from suffering the anguish she faced. In February 2010 Marzolla-Persi received a call late one night that her mother, an Alzheimer’s patient, had slipped on some powder and been taken to Ocean Medical Center in Brick. Hospital staff, however, raised questions about the injuries Peggy Marzolla had suffered, Marzolla-Persi told the Patch. 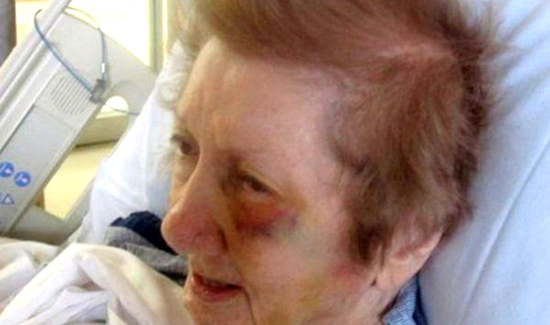 Peggy Marzolla, who didn’t retire from her job in the Paterson police department until age 81, had sustained a broken eye socket, a broken cheekbone, a broken jaw, a broken wrist, a badly bruised elbow, a gash on her left shin and welts on her back.